With so many products claiming to clean air, purifier technical evaluation is very challenging. New products claiming technological breakthroughs are introduced with heavy marketing faster than serious reviewers can adapt. My all time trademarked air purifier jargon favorite: “photohydroionization." Little scientific evidence is available, and the medical establishment is skeptical about implied health benefits from using air purifiers. Purifiers not making health claims don't fall under Food and Drug Administration jurisdiction. Manufacturer’s competing claims concerning cleaned air provide most of the available evidence. Deceptive marketing practices have resulted in actions by the Federal Trade Commission against some purifier manufacturers. Affordable purifying technology is a laudable goal, but misleading marketing and variable cleaning performance have left many buyers dissatisfied. The following links explore the technology of purifiers in detail. This is the first half of my site theme, "what you can't see does hurt you." The smallest health-robbing particulates hold the key to understanding why good purifiers cost so much. The inside story on the HEPA filter: why does good air purification cost so much? A quality HEPA filter will always be preceded by a good prefilter. Can a Purifier Clean Chemicals and VOC? Here is the second half of my site theme. I consider removal of invisible and often odorless gas phase toxins central to maintaining health. Does the Ionic Purifier Cleanse Air? 1. Electrostatic precipitators like the Freidrich C90a and Sharper Image Ionic Breeze. Another group of machines known as Ozone Generators deliberately create ozone, loads of it, as their central clean air technology. Ozone is a health hazard at all levels of exposure, especially to those with overt symptoms. A time honored air purifier technology is the use of ultraviolet light to clean up microorganisms. The second UV purifier technology is Phoyocatylitic Oxidation. Whole house purifiers, which add on to existing heating and cooling systems, are discussed next. Whole House Air Purifier: cost effective?. Noise is constant problem, with many consumers wanting quiet air purifiers that may require a technological great leap to produce. Virtually every authority tells you to choose air purifiers that clean only allergens and irritants which seem directly related to your symptoms. This idea had only limited technical merit from a medical standpoint, and has been hijacked by marketers to confuse “consumers” being led to "choose" specific products. Since the requirements of each user are considered unique, the recommended purchase is the minimum machine, in terms of price feasibility, which reduces your specific allergy. People who only have seasonal allergies, like my wife, are supposed to need less air cleaner than those who are more sensitive, like me (MCS). 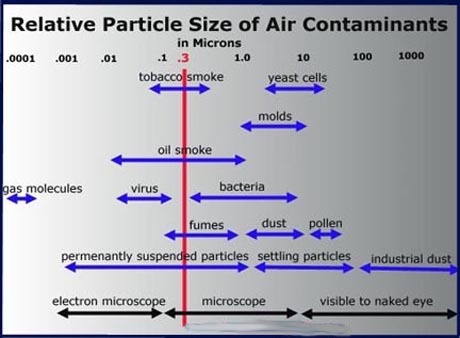 Many allergy/illness causing particles are much smaller than the HEPA most-penetrating particle standard 0.3 microns. For example, cat dander and dust mite particles can be as small as 0.1 micron, smog and cigarette smoke have particles that go down to about 0.01 microns. Numerically, 90% of all particles are smaller than 0.3 micron. This group of lung penetrating particles includes viruses, some bacteria, smoke, and particulate smog. Consider the example of secondhand tobacco smoke. When a typical inexpensive 2.0 micron HEPA-type air cleaning machine has filtered the largest (visible) particulates, room air will appear to have been cleaned. Appearances deceive, as gas toxins and fine particulates remain. In the chart above, note the significant health threats to the left of the red HEPA limit line. The central theme of this site, and my entire life, is that chemicals you may not consciously perceive can destroy health. The vast majority of less expensive air purifiers make it seem like the air is clean. What you don’t know, and cannot see, can hurt you. Today’s allergy can progress along a continuum toward more serious illness, so: a multistage HEPA-with-meaningful-weight-carbon series filter is, in my humble opinion, the best choice. Some new air purifiers clean air with ozone free electronic methods, and more arrive daily, but the best still use some HEPA and carbon. Notice that I did not say well built HEPA air purifiers without serious carbon are not cleaning air: many people will notice reduced symptoms when pollens and other large particles are gone. A top HEPA and heavy-carbon-VOC air cleaner isn’t in everyone’s price range. I don’t write air purifier recommendations just for wealthy folks, but please get the best air cleaner you can afford and don’t waste hard earned money on bogus or unproven air cleaner technology. Best Air Purifiers at Amazon.com.